I help professional women and women-run organizations and teams become more efficient, more empowered, and more successful with less energy output. It's your kingdom. Make it REIGN. 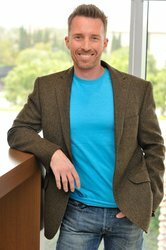 With an intentional education in spiritual psychology and positive psychology, and an accidental education in neuroscience and neurobiology, high-performance executive coach and motivational speaker Chris M. King works primarily with professional women and women-run organizations and teams to get clear, get moving, and get results. Clients experience improvement and performance and efficiency of up to 40%, as well as improvements in accountability, goal attainment, discovery/design of creative solutions, employee engagement and retention, profitability, mind share, and workplace satisfaction. It's your career, your life, your world. It's your kingdom. Make it REIGN. Have you worked with Chris M? Tell your friends! Chris M doesn't have any reviews yet. 007 had lots of toys. Superheros had abilities that helped them. And you have secret weapons you aren't just unaware of, but are actively discounting.